Synopsis: Boston sets out to demonstrate that all of life’s pain and suffering experienced by Christians is ultimately ordained for our good by an absolutely sovereign and loving God. The term ‘crook in the lot’ is a biblical reference Boston uses as the main text for his work. The scripture is taken from the book of Ecclesiastes chapter 17, verse 13: Consider the work of God: for who can make that straight, which he hath made crooked. Our lot, that is, our portion in life, is assigned by divine providence. It can have many crooks, or twists and turns, that pulls us out of normalcy, routine and comfort. The crooks in our lot may lead into periods of trials, sufferings, afflictions and persecutions. That’s not so far fetched. One day I updated my Facebook status with a reference to the book title and a friend immediately responded with an urgent ‘What happened, you and the family OK?’ type of remark. Whatsoever crook there is in one’s lot, it is of God’s making. What God sees meet to mar, no one shall be able to mend in his lot. The considering of the crook in the lot as the work of God, or of his making, is a proper means to bring us to a Christian deportment (demeanor) under it. Kudos: Thomas Boston is a thorough expositor of the Holy Scriptures. He takes a relatively obscure verse and builds a powerful case for God’s sovereignty and the wisdom he displays in the affliction of men. This little treatise is much needed in today’s Christian culture. Suffering and affliction in the the life of a believer is considered a failure of faith: a demonstration of a deeply sinful disposition and a carnal life devoid of personal holiness. It is antithetical to every teaching of the ever-popular Word-Faith doctrine. It also contrasts the doctrine of a vast majority of modern Evangelicals with their Seeker-Sensitive, Purpose-Driven agendas designed to help members achieve their best life now or a freer, lighter, less stressful lifestyle. Boston emphasizes believers’ utter dependence upon God’s graciousness through life’s afflictions. He calls Christians to openly admit their weakness and to call on God’s strength to endure and persevere. We cannot make our paths straight, only God can. Boston exhorts us to cease from striving against circumstances that lie beyond our control. We need to put our trust in God’s hand who alone can make our paths straight according to his majestic sovereignty and eternal wisdom. The truth is, the crook in the lot is the great engine of Providence for making men appear in their true colours, discovering both their ill and their good; and if the grace of God be in them, it will bring it out, and cause it to display itself. It so puts the Christian to his shifts, that however it makes him stagger for awhile, yet it will at length evidence both the reality and the strength of grace in him. 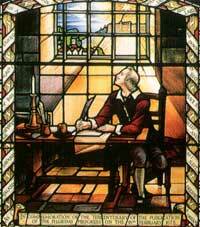 Knocks: Thomas Boston was a Scottish Puritan who lived in the late 17th to early 18th century. Consequently, his prose can be rather archaic at times. Strangely, even though he is a much easier read than many of the Puritan writers, I still trudged through this little book. It’s not a difficult read by any means but is so full of rich, theological and practical content that it should be savored slowly. Recommendations: This is an essential book for every Christian believer. More than a theological treatise, Crook in the Lot gets to the heart of the Christian life. It is practical for our walk in holiness and prepares us for the storms that will inevitably rage against us. It should be read and committed to heart. Crook in the Lot is one of the most comforting reminders of God’s loving providence for all of his beloved children that you will ever read. Thanks for the review. I’ll add this one to my wishlist for sure.